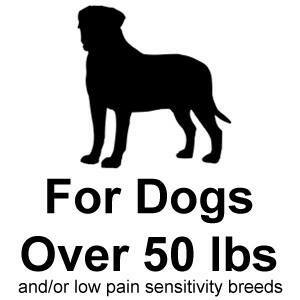 The PetSafe Stubborn Dog Fence Kit is a good choice for dogs with low pain sensitivity as well as very large breeds (over 100 lbs.). The name (Stubborn) is somewhat misleading as the fence is not geared towards a dog that has a stubborn personality so much as breeds that have been bred to have a low sensitivity to pain. This fence jacks up the strength of the correction by 50% over the average dog fence system, making it a good option for those of us with dogs in the guardian and fighting breeds like German Shepherds, Akitas, or Pitt Bulls. The system is powerful and needs to be used prudently to avoid over-correction. This system is a great option for households with dogs of differing size and/or breed as it is cross compatible with other PetSafe collars. 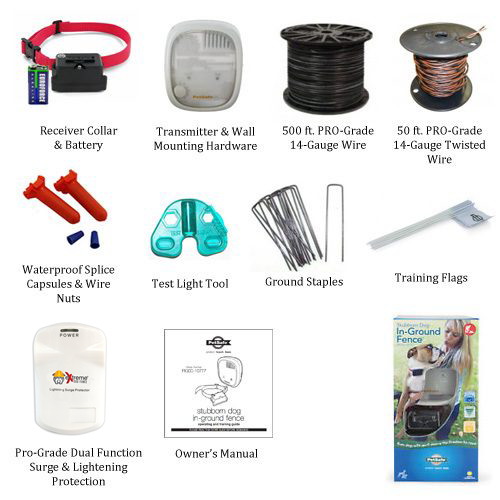 Our upgraded PRO-Grade package improves the performance and lifespan of your electric dog fence by including professional grade wire, surge protection, lawn staples, and an extended warranty. I am a single woman who lives alone with my bulldog. I don't always have time to make sure that we go on walks but he gets to exercise within his new boundary. It is nice because I do a lot of traveling and I just have friends come by to let him out and I don't have to ever worry about him leaving me. I wasn't sure which package or system I wanted but was able to get the help from FlexPetz. Told them about my yard and my dog and they recommended a system and everything I needed to install it. We went over videos and different layouts until we figured out which was best. I feel like my dog is safe and I also feel that the system is going to last a long time. Weekend project for installation but the website may it easy. Stubborn dogs...meet your match. The Pro Grade Stubborn Dog fence is a reliable fence solution. One of the best things in life is to accomplish. I had never setup a dog fence like this before, so I was eager to get this setup under my belt. We got it setup on our first try. We contacted the Flexpetz staff for assistance on training, and they were very helpful. I would surely recommend anyone to try Flexpetz for your dog fencing. Two thumbs up for the Petsafe Stubborn Dog Fence. Some people may not find it cost effective to install a wooden or chain link fence in their yard. Installing that type of fence is a permanent installation. That would be a loss if the resident decided to move, and didn't want to have the fence relocated. We decided to try out one of the static fences that are invisible in the yard. The only installed piece is the wire, and that can be replaced easily if changing residence. The installation only took 2 hours, and the wire was tested and buried as per our requirements. Training is going to be next week. I'm confident that our dog will pick up the process pretty quickly. We're very happy with our purchase at Flexpetz.com and would suggest anyone needing a fence system to contact them and let them assist you in figuring out the best fence solution for them. Flexpetz is right on point. The PetSafe Stubborn Dog Fence PRO-Grade is great. I have two very large dogs that are very stubborn. They are older and are set in their ways. I did some research to find the best dog fence systems that would be a good fit for these large dogs. They are Mastiffs and demand a lot of attention. I live on a 1 acre lot and these dogs are now contained and secured incredibly well. This dog fence system has made my life much easier. They are also getting an ample amount of exercise due to this dog fence system. It was very simplistic and easy to install this dog fence. It has been smooth sailing since the installation of this dog fence system. I also take my dogs to a lake for fun. The waterproof collars is an asset for me. I was skeptical about how well the dog fence and collars would hold up to two very large dogs. I am amazed at this dog fence's attributes. Thank you FlexPetz for the great investment and excellent customer service. My husband got the system installed last week and training is going well. I knew nothing about electric dog fences but were desperate to find a solution for containing our Shepard. A physical fence was going to cost a fortune. I called Invisible Fence and the cost was almost the same. We found FLEXPETZ and the free tech support was invaluable. They helped us choose a system and design the layout. They had some great videos and illustrations of installation and training. Problem solved. Thank you FlexPetz for advising me on a excellent dog fence for my 2 labs. I am pleased to let others know that the system that I have purchased from FlexPetz is phenomenal. I have been in the market for a substantial length of time searching for a quality dog fence. I was recommended to use a Petsafe stubborn dog fence pro-grade. I am extremely satisfied. My dogs are getting 10 times more exercise now. I have peace of mind that they are safe outdoors. Thank you FlexPetz. This dog fence has been a game changer. This fence has made life much easier than I would have ever expected when it comes to keeping my dogs secure within our property. I was very impressed with the help and knowledge of FlexPetz. I had some questions during installation and I was able to have my questions answered. My dogs are stubborn. It is fitting that I purchased the Pro-Grade Stubborn Dog Fence. The process has been extremely easy to contain my dogs and keep them safe. I would highly recommend this system to friends and family. Flexpetz were very helpful throughout the entire installation process. Thank you FlexPetz. Very pleased with this system! I did not really think that this would work with my pit, but sure enough it did with no hesitation. The learning part was a little long, but I think he got the hint just yesterday. He tried many many times to test the fence and I didn't think he would ever learn, but it does keep him in like I needed it to. He has not busted out once, but the boundary is still something I guess he is not used to. I feel like I will still be training him for a while. No worry's! I am very happy, he doesn't cross the line and that is an accomplishment! Works great for my GS! We have had this system in place for 8 months now and it has been working great! The collar is a bit large but Geoffrey can be pretty stubborn and is quite strong so we wanted to make sure we got something that gave him a jolt. He tested the fence a few times but now will pretty much turn back as soon as he hears a beep. My favorite part is the battery seems to last much longer than the one on our previous fence, about 5 months. And 9 volt batteries are much easier to find. Finally got a handle on my Pretty Girl. My beautiful Greyhound was getting out all the time but now she is contained to the farm that I have no more problems with her leaving. I was afraid that she would get stolen, but now she doesn't leave the property. Putting in the fence was easy and a monkey can do it. I just want to say if you plan on putting something on your property and have no use for a physical fence, this is the way to go. If you want to do it all over again, then I guess buy the cheap crap. My suggestion if you want to do something right and get it done, do it right the first time around. My neighbor had to rewire his fence three times before he bought the better wire. Just thought I would put my two sense in. This system is top notch. I am a satisfied customer. I decided to buy a DIY electric dog fence and began a search online. I discovered Flexpetz.com. The customer support was exceptional. I was advised on the best possible system that would work for me and my 2 dogs. I would suggest this system to my family and friends. This system has made my life much easier. My dogs are now exercising much more, compared to just walking them a couple times per day. Thank you FlexPetz. I am a satisfied customer. I am not new to electric shock dog fences for dogs. I've had exposure to the everything from the big installation companies' products down to the cheapie systems that are on Walmart shelves. Having a pitt bull comes with its own requirements when considering such a system. He's got a high pain threshold, so my first choice was the stubborn dog system. I don't even have to set it on the higher levels, because he responds on level 2. The pro wire looks like it's going to last quite a bit longer than the Walmart system wire. I'm very happy with the Stubborn Dog professional package, and would recommend it to anyone. The PetSafe Stubborn Fence Pro-Grade is Great. This dog fence has been a real life saver for my family and I. I installed the dog fence very easily. I had no problems putting this system in-ground. I really like the fact that my dogs now get the exercise that they need. I also sleep better knowing that my dogs are contained and will not venture towards a road that is near by. I would recommend this system to all my friends and family. It is high quality and has lived up to the reputation portrayed online. This system is absolutely a best buy. Thank you. PetSafe Stubborn Dog Fence is super. We have been using the PetSafe Stubborn Dog Fence for 3 months now. I must comment on the high quality of the system. In comparison to a system we had previously this system is light years ahead. The system has been a great asset to the well being of the dogs we have. I must say that the level of customer service has been great. The customer service at FlexPetz was wonderful and extremely helpful. I would recommend this system to all my friends and family. Stubborn Dog definitely solves the problem. The PetSafe Stubborn Fence Pro-Grade is Terrific. I think this dog fence is so awesome. I was unaware that anything like this existed. I was at a friends house one weekend. She explained to me how she keep her dogs safe and constantly active. That day I discovered what a dog fence actually was. I ran the idea by my husband and we decided to give it a go. It has been smooth sailing ever since. I love the peace of mind that my dogs are safely contained in the yard. The help at FlexPetz is fantastic. Their support helped tremendously during installation of the dog fence. Thanks FlexPetz. Last month was my birthday and my husband gifted me with PetSafe Stubborn Dog Fence PRO-Grade. Its really awesome,My love to my pets is more now that I can let them outside without having to leash them, really is much more convieient. Quality and price are so affordable to every one individual and I seriously recommend everyone.I have three dogs that hated staying inside my yard. They would always dig out and I would have to chase them around the neighborhood. My neighbors were starting to complain about them getting into their garbage and what not, so I decided it was time to make a change. Also loving the indoor system! No more jumping on the counters and stealing food, Zeus and Seizure get much more play time outside now, not really to hard to install although it was quite a work out physically.